Photo by Jim Muchlinski Medea Noel enjoys operating Madea’s Cafe in Clarkfield. The city had a cafe property available, one that’s provided an opportunity for her to apply her food preparation experience to restaurant management. 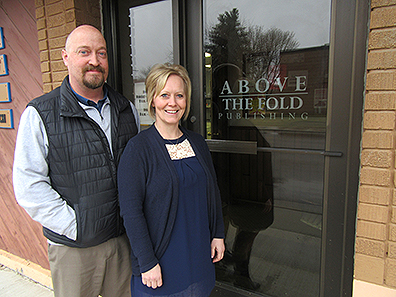 CLARKFIELD — One of Clarkfield’s downtown traditions became a 21st century career opportunity in the past year for Medea Noel. She opened Medea’s Cafe on Oct. 27 at the cafe portion of Clarkfield’s centrally located business property known as the Diamond Mall. The establishment was previously called the Friendship Cafe (named after Friendship Township, Yellow Medicine County, which includes Clarkfield) and later the Cottage Cafe. She followed up by inquiring with Clarkfield’s Farmers and Merchants State Bank and the Clarkfield Economic Development Authority. It led to a contract with the EDA to operate Medea’s Cafe, along with the potential to someday purchase the cafe property. As part of the start-up she replaced tabletops, bought supplies, and coordinated caulking, sealing and electrical upgrades. She also purchased a new buffet table, which has helped for serving crowds at public events. She offers a Sunday buffet every third Sunday of the month, which works into a schedule that includes monthly dinners at two Clarkfield churches. Additional parts of the schedule include funeral lunches and special events. Two weeks ago Noel served vendors and visitors by hosting a craft fair with 11 booths. Last week, 140 hamburgers were served for a Clarkfield Lions fundraiser to support playground equipment purchases at Clarkfield Area Charter School. The cafe operates from early morning until early afternoon. It employs two cooks, two dishwashers and several waitresses. Medea’s is Noel’s first business venture. 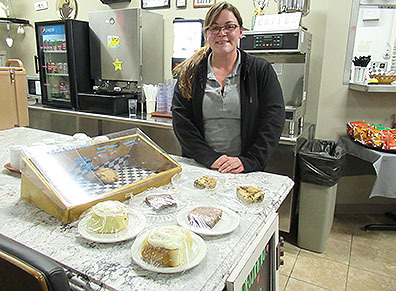 She brings restaurant experience into it through working at Country Kitchen and Coborn’s grocery deli and bakery in her hometown of Montevideo. She also draws upon experience gained by growing up in a large family that has often enjoyed gatherings with meals prepared for a sizable crowd. She first thought about food and cooking as a career possibility in the spring of 1997 when, along with family members, she helped to serve big batches of soup to flood volunteers at the Montevideo Fire Hall. She was a high school student at the time, which gave her the opportunity to provide flood relief through food service as one of many teenage students who were excused from school to serve as flood volunteers. She’s enjoyed seeing substantial repeat business and a core of regular customers from Clarkfield and the surrounding area. The “community table” at Medea’s is intended for anyone who wants to go out for lunch without having to either make arrangements with a friend or eat alone. She’s begun to look ahead toward both short-term and long-range opportunities. One involves event sites and possibly catering with a mobile service truck. She’s also interested in the possibility of at some point moving ahead with the cafe ownership option. Margaret Weaver of Clarkfield, a regular customer at the cafe, said it serves as a cornerstone for the business district as a daily gathering place. She added that Noel has already proven herself as someone with the experience and enthusiasm needed to make it succeed. Sue Fritz, another regular Medea’s customer and a member of both the EDA board and the Clarkfield City Council, said working toward a promising future for the cafe property was one of the city’s top economic development priorities. She said the business has strong potential for continued growth. A back portion, which includes the buffet table, provides extra seating capacity as needed. Its visible location lends itself to attracting drive-by traffic on Minnesota Highway 67 as well as U.S. Highway 59 located two blocks to the west.